BlogHome » Blog » Mission: Translating a Website. Why? Mission: Translating a Website. Why? In an international world of ecommerce when the whole globe has become one huge department store, an enormous travel agency, more Internet users turn to online shopping, more and more small and medium size businesses as well as retail/travel giants invest part of their marketing budget to having their websites translated into various different foreign languages. 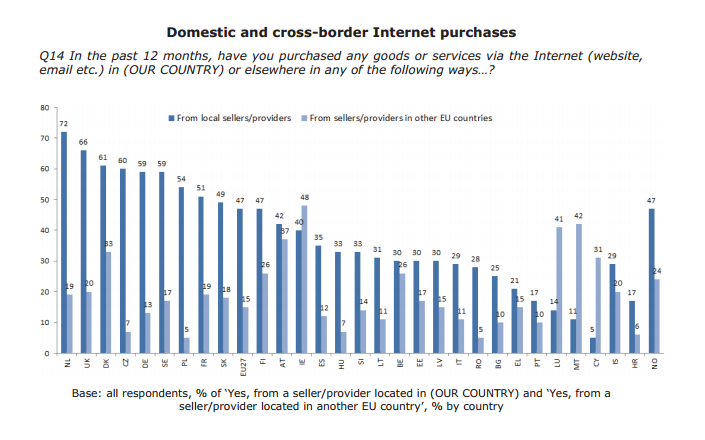 According to the latest report of Eurobarometer (2011), more than 4 in 10 (44%) Internet users in the EU thought they missed interesting information because websites were not available in a language they understood. More specifically, in a report published in 2013, online shoppers do not seem to follow the same trends in all countries, as showed in the following diagrams. Regardless the sizes of their establishment, hoteliers were amongst the first to realize that having their hotel’s website translated into different languages would automatically have an immediate impact on their total bookings and sales. In countries that base a large part of their national income on tourism, hotel websites are translated into three and sometimes four foreign languages based on results of their market research. The latter does not only apply to large hotel chains but even to small and medium accommodation establishments. As the Internet was gradually and steadily becoming part of our daily routine, large travel agencies and huge retailers followed their example. Retail giants such as H&M have started launching their websites in languages other than English to accommodate customers and clients in non-English speaking countries. Small and medium sized have now starting to invest budget for the translation of their website to strengthen their online presence. Young entrepreneurs of all disciplines that make their first steps in the market, those especially in small populated countries, they have it as a norm to offer the content of their websites in at least one more language than their native one. These young entrepreneurs do realize the potential such a move will be created for the success of their business. Despite the negative financial climate that has spread in Europe during the past years, yet, they do dare to think big. Showing respect to their clients, and wishing to please them in order to permanently include them in their clientele, already possessing the knowledge that commerce is give-and-take, two-way traffic, they realize that a customer will respond positively towards a website whose content is available in their native tongue. They fully understand that they never know where their next customer or client will come from! I recently contacted a research for translation agencies in Japan and more than half of the websites I visited were offered only in Japanese, which instinctively made me close these websites as I do not speak the language. Have you ever visited a website in a language you do not understand? What did it make you feel? Would you like visitors of your website to have the same feelings when visiting your website? Please, share your thoughts! So, graduation! A Translator? And, then what? Louise’s story!